'In Focus: Women of Board Gaming' is an exclusive series from Punchboard Media that spotlights women in all facets of the board gaming industry. Our guest this week is Carolyn Tagmire, the Deliverer of Joy for Button Shy Games. The interview was conducted over email by Eric Buscemi. Hi Carolyn! Before we ask about your work at Button Shy, let's find out a bit more about what kind of games you like to play. What are some of your all-time favorite games? How about favorite designers? My favorite games are usually either short, party-like or cooperative. I have enjoyed some longer games, but have very little time to focus on longer games since I am constantly disrupted by the kids. A few of my absolute favorites are America, Forbidden Island, Wits and Wagers, Codenames, Ticket to Ride, and Roll For It. I have played many games but those are usually the games people know I will jump in on. My favorite games are usually very light and involve fun interaction. I have no particular favorite designer although I love meeting them all at conventions. I am also always down for a game of Candy Land (even if it has no real options... I love the colors, candy and the nostalgia). We are currently playing Charterstone, and this might be my gateway to more involved games. I am loving it and have a hard time waiting to play again! You have a unique job title with Button Shy. What is the day in the life of a 'Deliverer of Joy' like? How long have you been doing it? I have been on this crazy adventure with Jason [Tagmire, Carolyn's husband and the founder of Button Shy Games] since the start. My job has changed its role as time has passed. 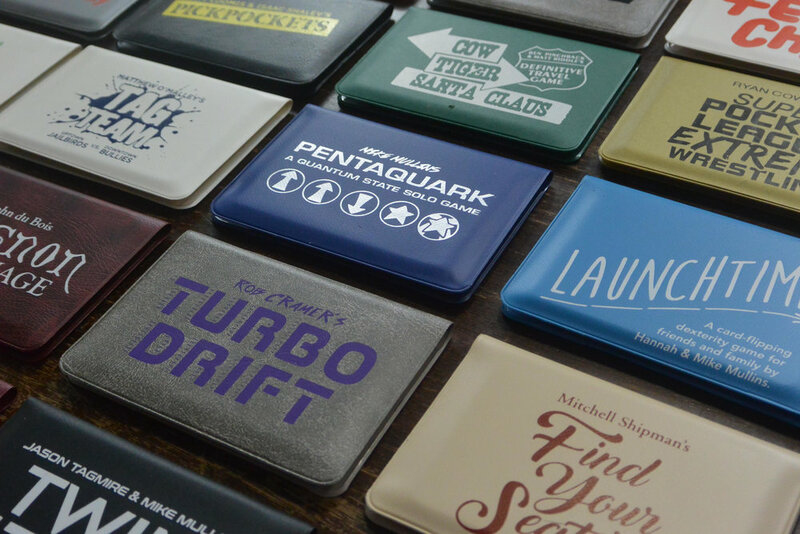 I originally filled in any gaps such as getting a few wallets together here and there or offering my opinions when asked. Today, I currently put together all of the wallet games and handle about 95% of the shipping. I also get together all of the inventory and make sure that what we need is ready to go. I am a high school biology teacher and a mother of 3, so every day can be different and definitely a little hectic. Any extra minute I can work into my schedule is spent getting the games together and sending them out. How did the company get the name Button Shy anyway? It doesn't seem very game related. The beginnings of Button Shy was not game related. It all started with a button/pin company that we used to run almost 15 years ago. We would produce bulk orders of buttons for bands and artists. Jason has always loved creating products of his own and I feel he has finally found his calling in games. The name is a throwback to a great time and looking forward to a bright future as well. Button Shy Games is best known for publishing 18-card wallet games. 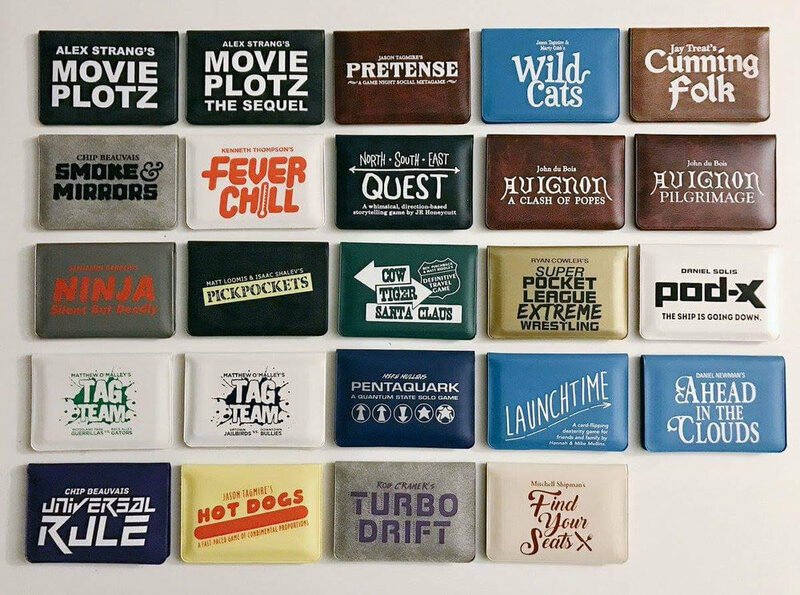 What are your favorite Button Shy wallet games? I have really come to know and love all the wallet games. However, the ones I am most likely to recommend are Circle the Wagons, Ahead in the Clouds, Universal Rule, Pentaquark, and Cunning Folk. Are you involved in deciding which games get signed? What about the playtesting process? I will be asked to playtest the games and give opinions but usually Jason has his mind made up about which games he wants to sign. I enjoy looking over the games and getting an idea of how it will fit into the wallet line. I most enjoy helping to pick colors and art details. As for gameplay, I leave that to the experts. How exciting was it seeing a Button Shy game get licensed with the X-Files theme? Do you have more licensing/intellectual property deals in the works? A Fast & Furious version of Turbo Drift, perhaps? It was definitely cool to see Circle the Wagons get re-themed into an X-Files game. I would love to see some other games with a new theme, but I am not sure what may happen. A Fast and Furious version of Turbo Drift would be awesome. I would love to see a Willy Wonka themed game since that is one of my favorite movies although I am not sure which game would work. 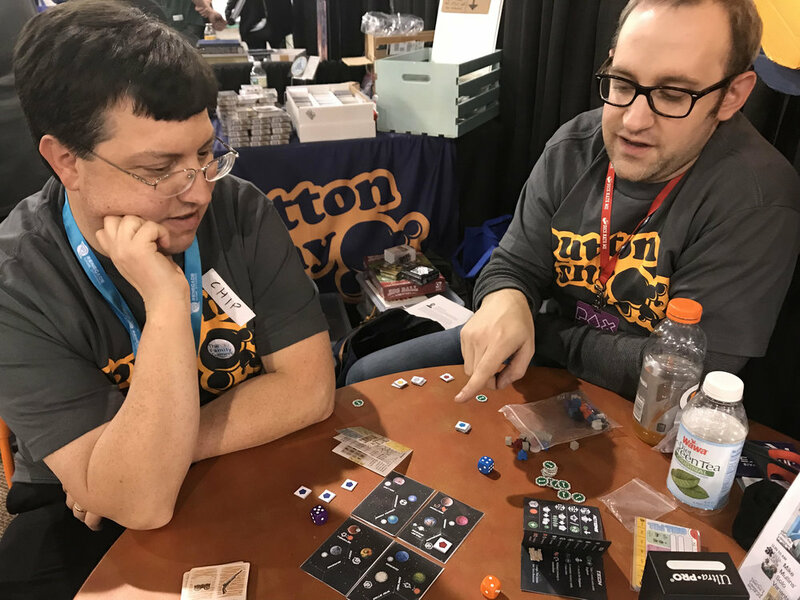 Button Shy's tagline is "A small board game publisher that is simply doing things its own way." One of the different things Button Shy does is its Board Game of the Month Club. How do you prepare to put out a new microgame through the mail every month? Jason works with the designers on making the microgames. My job is to sort it all, pack the envelopes and ship them out. Basically, he does all the technical stuff and I do the production end. I am just as surprised as the subscribers each month when I see what is going in each package. It is fun and something to look forward to. You have Sprawlopolis coming to Kickstarter soon. As Deliverer of Joy, what are your responsibilities for the Kickstarter campaign? I have taken on a much larger role with the Kickstarter campaigns. It used to be that I would just help get the packages together. I will now be making sure that the shipments run smooth and will be responsible for all the shipping. I am very excited about Sprawlopolis as it is a cool game. I am looking to forward to watching and following the campaign as I take on my bigger role. I hope to connect with the supporters more and get to know the people supporting it. Sprawlopolis was designed by the same team -- Steven Aramini, Danny Devine, and Paul Kluka -- that designed Circle the Wagons. What similarities does it have? What makes it different? What kind of gamers will enjoy it? Instead of being two player competitive, Sprawlopolis is a 1-4 player cooperative game. It features the same multiple scoring conditions as Circle the Wagons, but feels like a completely different game. A gamer that would enjoy it would be someone who like the tile laying of Carcassonne, but likes a puzzle-like experience. Any other upcoming Button Shy games you can tell us about? Along with Sprawlopolis, Supertalll will also be featured in the Kickstarter campaign. It is a fun game by Nat Levan and the artwork is being done by my brother, Marty Cobb. I have been watching it come together and cannot wait to see it completely finished. This game is a Euro-style skyscraper building game. It is definitely a fun game and I always enjoy Nat's games. I understand Button Shy will be going to PAX East in April. What are you doing to prepare for it? On a related note, how did PAX Unplugged go last November? I will be staying home for PAX East. It was also business as usual for me during PAX Unplugged. However, I will be doing plenty of work preparing for the convention. I do all the inventory, packing the car and making sure every single detailed is covered. I did the same for PAX Unplugged and I am prepared to do it again. 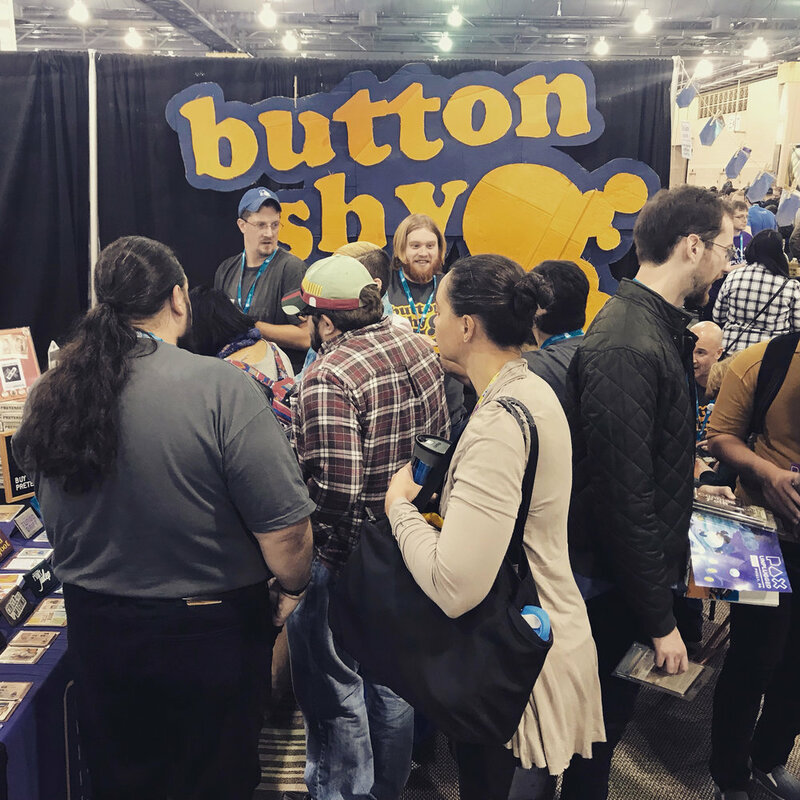 PAX Unplugged was a great success for Button Shy. The best part of PAX Unplugged was that is was in Philadelphia which is less than 10 minutes away. PAX East will be a bit more of a challenge but I am looking forward to getting stuff ready and it being successful. The convention team at Button Shy has some great ideas and keep an eye out on Twitter for any events that will be occurring at PAX EAST. Before we wrap this up, anything else you'd like to share with us about yourself? Any passions, hobbies, or interests? I have many interests and passions. While games and family are at the forefront of my life right now, I try to take time to watch as many TV shows and movies as I can (Bob's Burgers and Jurassic Park are my obsessions for now), continue my studies in science to keep my job interesting (Currently, I am the Advanced Placement Environmental Science teacher and Environmental Club Advisor AKA "Captain Planet"), collecting as many scented markers and stickers as possible (I will never stop) and having as much fun as possible. My students and family would say I am a nerdy weirdo and I take that as the highest compliment.